This weekend I shall be strolling (perhaps sprinting) through the dark side of the Gardens, which grows fear instead of flowers. It'll be my first time at Busch Garden's Halloween event, Howl-O-Scream so I'm dying to see what creatures await us when the sun does down. My favorite year round attraction, the Curse of DarKastle, is already a bit spooky - it lurches riders through a frozen castle as they try to escape a wicked king that morphs into a werewolf. In anticipation, I stalked around the moonlit mountains of Etsy in search of unique handmade jewelry. Wolf necklaces surrounded me with sharp teeth and gleaming eyes. Love Gypsy's Talisman! The Howling Wolf Pendant is pretty spectacular, too. WOW! Great selections! I love wolves (and werewolves!!). 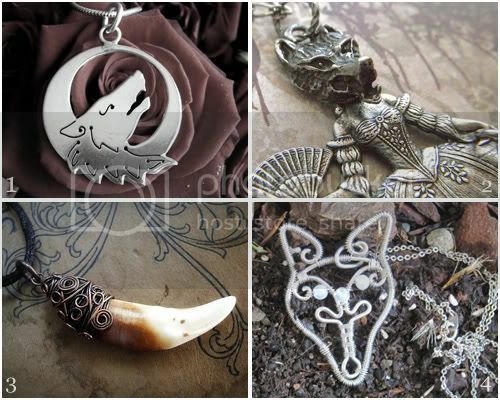 Thanks so much for featuring my Werewolf Talisman.